For those of you who are active on other forms social media, you might know that today is #ThrowbackThursday. For those who do not engage on Twitter, Facebook, or the like, Thursday is the chosen day upon which people traditionally post old pictures of themselves, friends, places, etc. in a show of widespread nostalgia. Why is this done on Thursdays? Probably just because the alliterative #ThrowbackThursday makes for a perfectly hashtaggable and marketable saying to affix to said posts. There's usually not a lot of depth to social media discourse, after all. In honor of the weekly "holiday," today, I've decided to throw it back a bit on Wrigley Roster Jenga. In fact, I'm going to throw it back about as far as is possible when it comes to Chicago Cubs baseball cards. As evidenced by my earlier post about the curious case of Bug Holliday, I've been on an 18th century baseball kick. With that in mind, let's take a look at the proverbial "baby pictures' of the Chicago Cubs franchise by examining the cards of the very first team to fill out a National League lineup, shall we? You might know his name best for the sporting goods company he founded in Chicago that same year. 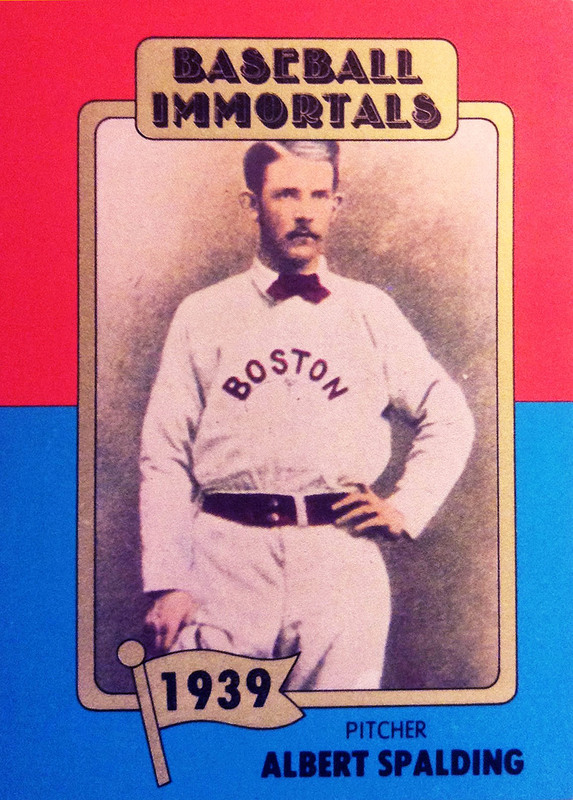 But, before he became a shrewd and successful businessman, Spalding was an inaugural Hall of Fame hurler for the old Boston Red Stockings and the White Stockings. In addition to calling the shots, Spalding was the main man to step into the pitcher's box for the Chicagoans during the 1876 season, leading the circuit with 47 wins to go along with a 1.75 ERA in 528.2 innings pitched.... obviously, it was a different time! Additionally, Spalding tossed the first shutout in National League history, against Louisville on 4/25. Al is represented in my CATRC binder by this SSPC Baseball Immortals single (the set was continuously produced from 1980-87). Adrian "Cap" Anson manned third base for the first National League edition of the Chicago White Stockings. Anson is often cited as one of baseball's first true superstars, becoming the first member of the 3,000 hit club. He would eventually take over the reigns as a player-manager and held that duel role through the 1897 - his influence on the team being so great that they were rebranded as the Orphans after his retirement. Anson is repped by this Old Style-sponsored team-issue from 1992. Anyway, before all of that, Anson debuted with the Chicago team by batting .356, good for second best on the team, while also driving in 59 runs (tied for the team lead), and smashing two homers (again, tied for the team lead). All in all, it was a great start to a beautiful, long-term relationship. Ross Barnes at second base, Cal McVey at first base, and John Peters at shortstop. Unfortunately, Peters does not appear to have a single baseball card to his name. On the bright side, Barnes and McVey are not so unlucky and show up in my CATRC, courtesy of 2011 TriStar Obak and the over-sized 1976 Bob Parker More Baseball Cartoons. Both of these cards contain some fascinating trivia. For example,, as the front of the Obak single notates, Barnes was the very first person to crack a home run in National League history. This came in the Stockings' second game of the season (5/2), at Cincinnati, and was of the inside-the-park variety. Ross was an offensive juggernaut in that first season, leading the league in batting average (.429), hits, extra base hits, and runs. Sadly, Barnes would take ill in 1877 and would never again match that offensive production. Artist Bob Parker's cartoonization of Cal McVey includes quite a bit of information on the front. The versatile player would appear all over the diamond in his career, but stuck mostly to first in '76. McVey was also good with the bat and would twice knock 18 hits in a four-game stretch that year. 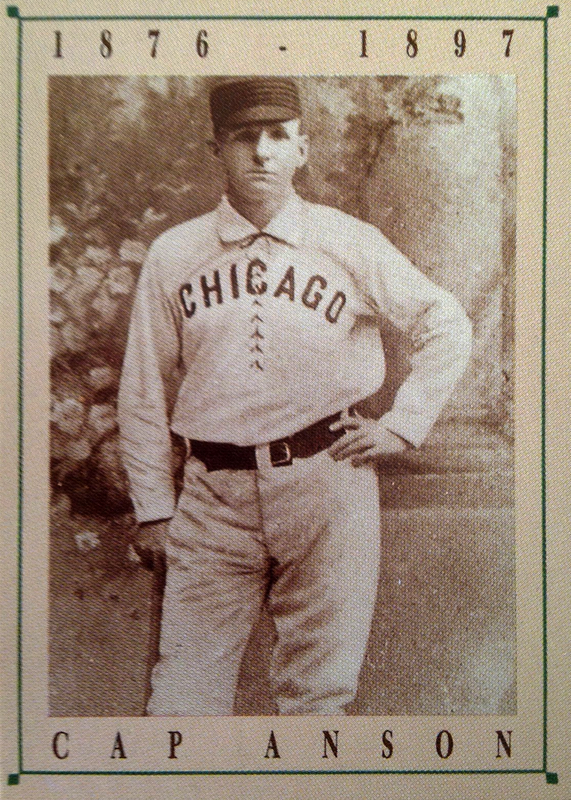 John Peters had been the regular shortstop for Chicago since 1874, during their days in the old National Association. Like most of the 1876 Cubs, be swung a potent stick, batting .351 in 66 games. Unfortunately, like I mentioned earlier, his 11 year Major League Baseball career (5 spent with the White Stockings) was never commemorated on cardboard and his lot will remain vacant in my CATRC binder for the time being - such is the peril of building an all-time roster collection around such an ancient franchise. We've already seen TriStar Obak represented in this #Throwback - which, this time, showcases Bob Addy, who is credited with having introduced the slide to our national pastime. Back in 1866, while playing with the amateur Rockford Forest City Baseball Club, Addy evaded a tag by sliding and a key element of the game was born. Ten years later, the Civil War veteran was still playing, this time as half of a right field platoon for another Illinois-based nine, the Chicago White Stockings. The innovator posted a .282 batting average in 32 contests, which seems fair; but, in that high-scoring, poorly-defended era, Bob brought up the rear on the Chicago club. After one more season of National League play (with Cincinatti), Addy would call it a career. Splitting time in right with Addy that year was another veteran of both baseball and war, Oscar Bielaski. Oscar learned the game from his time spent serving with the Union Army and he would eventually become the first Polish-American to record his name in baseball's record books. However, by the time he brought his talents to Chicago in 1875, Oscar's playing career was nearly over. During his final year of 1876, Oscar batted a paltry .209 while splitting time in right with Addy, before returning home to Washington, D.C., where a stable career as a clerk in the auditor's office at the Navy Yard awaited him. Fun fact - his son, A. Bruce Bielaski, would go on to become the head of the FBI. To my knowledge, the Polish sports hero has never been properly honored with a mainstream trading card; thankfully, Gary Cieradkowski - published author and proprietor of the Infinite Baseball Card Set - has filled the gap. If you haven't acquired any of Gary's work or followed his blog, I highly recommend you do so - the cards are of high quality and I've learned quite a bit about the sport from his writing. This is the first time that the Origins of Baseball boxset, produced by American Archives in 1994, has made an appearance in this post. The antiquated-looking cards showcased baseball's pioneers and key moments in the development of the national game. Luckily for me, Paul Hines - the regular centerfielder in the Windy City - made the checklist. Hines had been in town since the '74 season, the club's first since re-organizing after the Great Chicago Fire. The 21-year old batted .331 in that first NL season, tying with Anson for the team lead in homers (with two) and driving in 59 runs in 64 games. During the first five NL seasons, from 1876 through 1880, Hines had more base hits than any other player. He also believed that protective equipment signaled the end of the game, once stopping on the base paths to smash the opposing catcher's mask; he was a colorful character. Missing from the outfield equation is John Glenn... no, not the guy that went to the moon and there is no relation. The White Stockings' everyday left fielder, like the aforementioned John Peters, has never appeared on a baseball card... at least to Beckett's knowledge. 'Tis a shame. Maybe I should just get a card of the astronaut and call it close enough? For his part, Glenn contributed a .304 batting average and 12 walks (second on the club) - not "out of this world," but helpful. 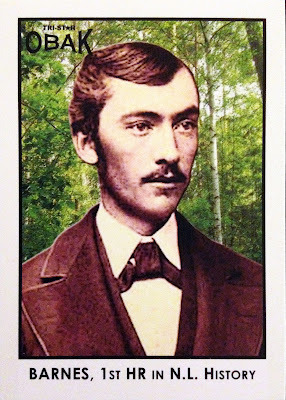 He played in the Second City from 1874-77. 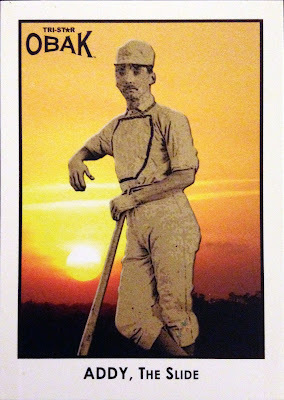 Deacon WHITE of the WHITE Stockings on a WHITE-bordered Old Judge reprint - that's just too perfect. White was actually contracted to join the Cubs for the very first season, in 1870, but got cold feet and jumped before play began. He eventually rectified this psych-out by coming back for the 1876 season, in what would be his only year in Chicago. All he did was lead the circuit in RBI, with an eye-popping 60 throughout the 66-game schedule, before jumping to the Boston Red Stockings, who are better known today as the Atlanta Braves. Finally, utility-man Fred Andrus cameo-ed in eight games with the team, as a catch-all. Bizarrely, Andrus would only appear in two MLB seasons (both with the Stockings) - 1876 and 1884 - with almost no other pro baseball experience. Seeing as Fred was employed by the Spalding Sporting Goods Co., it's thought that it was this connection that brought him to the diamond. While I don't have a card of him, strangely enough, Andrus does have a baseball card to his name, despite the odd circumstances surrounding his career, while Peters and Glenn do not. 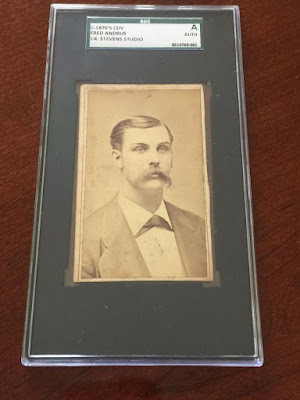 Of course, it's an incredibly rare CDV from the 1870's, of which only one is known to exist; so, I suppose that's essentially the same as not having one. However, he does also make an appearance in the checklist of Ars Longa's Mort's Reserve series; so, there is one attainable option out there. I'll have to keep my eyes peeled for it's next release. 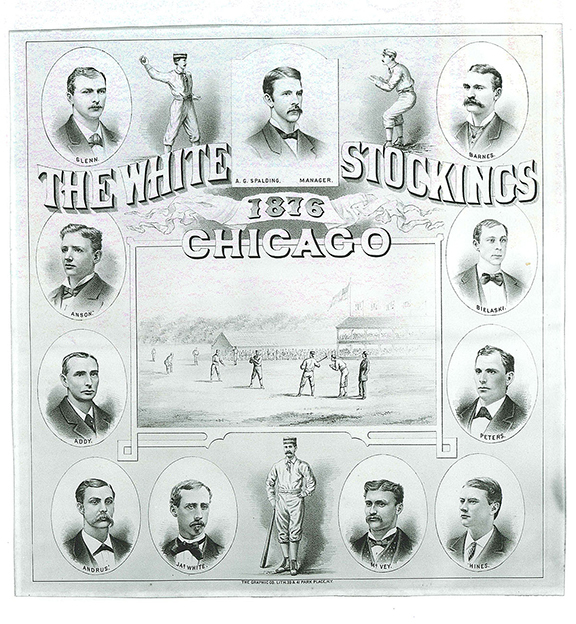 With that, we've reviewed the entirety of the line-up for the 1876 Chicago White Stockings - the very first edition of the club to take the field in National League play. This powerhouse of a team would go on to post a dominating 52-14 record and take the inaugural pennant flag by six games over second place Hartford. That's right - Hartford, Connecticut once had a Major League Baseball team. This kicked off a dynastic period for the Chicago team, as they would win six of the first eleven league championships - far off from the "Lovable Loser" image that would later be attached to the club. Perhaps they should have stuck with the White Stockings name? Of the 11 men who appeared on the diamond for the team, I have cards featuring eight of them - not bad, considering the team in question is 141 years old, as of this writing. I've long been fascinated by the early days of our national pastime and my favorite baseball team; thus, this is a post I've long been meaning to draft. In the future, I would love to bang out a post or two about the team's pre-NL days; however, my cardboard stocks are pretty dry for that era of team history. Maybe someday... For now, this is as far as I can throw it back for #ThrowbackThursday. At any rate, I hope you found at least some of this vanity project to be a tad bit interesting. It's got to be a least somewhat more intriguing than your friend's old pictures from high school parties or your aunt's baby pictures, right? Less embarrassing, anyway. Fantastic post! I loved this little history lesson of the early Cubs..er, White Stockings. I was familiar with Spalding and Anson, but not the other names. What would baseball look like if Addy hadn't invented the slide? Pretty stiff, I'd say. The Origins of Baseball card is a perfect design for players of that era. I want a hundred of those! Good post! Only outdone by the quality of mustaches on the photos.